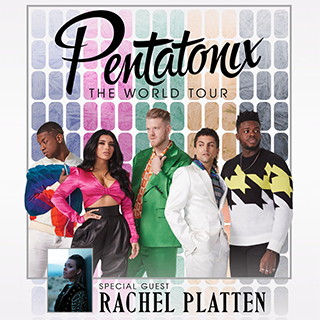 (Feb. 7, 2019 – Los Angeles, CA) Three-time Grammy Award-winning and multi-platinum-selling artist Pentatonix have announced a 45-date tour produced by Live Nation to kick off their World Tour, stopping at the AT&T Center in San Antonio on May 23. Emmy Award-winning, multi-platinum-selling recording artist Rachel Platten will join as special guest on all dates. Tickets will be available to the general public starting Friday, Feb. 15 at noon CT at ATTCenter.com, Ticketmaster.com, and 800-745-3000. Tickets for the tour will be available via a Patreon member presale running from Monday, Feb. 11 at 10 a.m. CT until Thursday, Feb. 14th at 10 p.m. CT. American Express® Card Members can purchase tickets in select markets before the general public beginning Tuesday, Feb. 12 at 10 a.m. CT through Thursday, Feb. 14 at 10 p.m. CT.